The Brooklyn Winery is a boutique urban winery set in the heart of Williamsburg, one of the borough’s most vibrant and creative neighborhoods. With a fully functioning winery as the backdrop for a reception, a Brooklyn Winery Wedding is an excellent choice. A Brooklyn Winery Wedding is uniquely chic. The space is romantic and modern, yet it retains a vintage charm. The interior of the venue has a warm ambiance, and is filled with reclaimed wood and hand-selected antique decorations. The wooden decor was crafted using materials from various locations in the tri-state region. The winery prides itself on using local manufacturing for the majority of its needs. 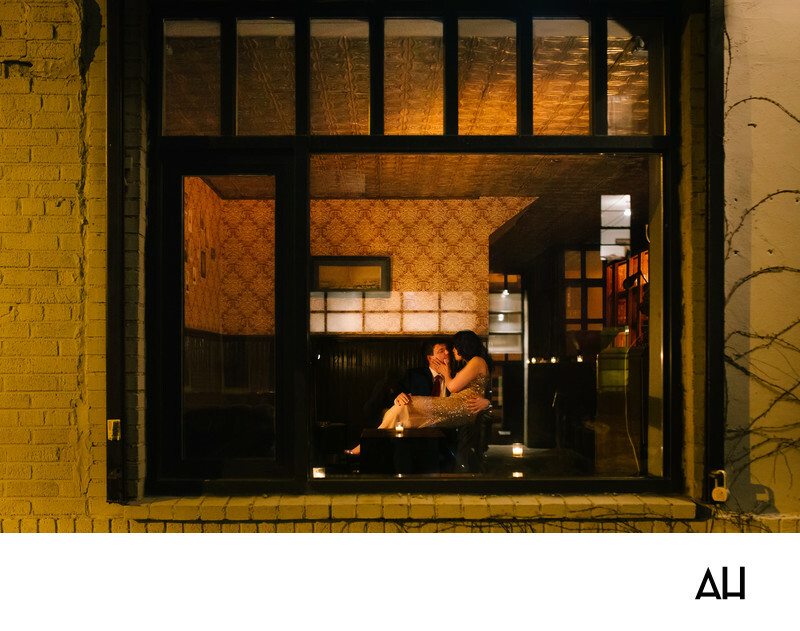 This image, taken at a wedding reception at the Brooklyn Winery shows the bride and groom, who snuck off to a private space for a peaceful moment alone. The couple and I planned to take this photograph with me being outside the window add the semblance of privacy in the picture. While the attention of the wedding guests is heart-warming, newlyweds need to take a few moments to breath and enjoy one another on their big day, just the two of them. There are a lot of interesting aspects to this picture. The white brick walls glow under the outdoor lights of the building. Vines travel across the exterior walls of the building and through the black frame of the window the bride and groom are seen sitting in a booth. They are alone in the dimly lit room, with a few candles and off-camera lights highlighting their figures. The walls around them are covered by dark wood and vintage wallpaper. Shadows dance on the intricate designs of the ceiling above them, but the couple notices none of this. They have eyes only for each other on this happy day.